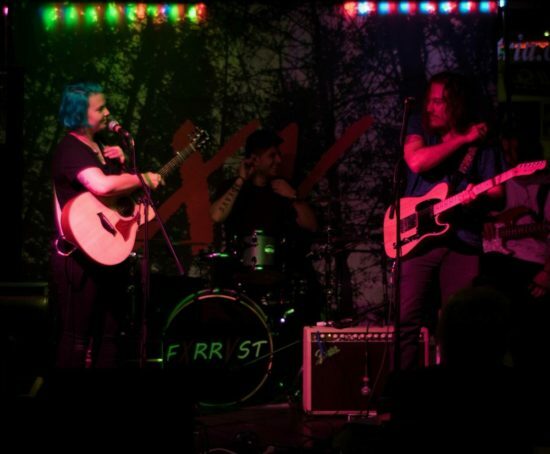 The Toronto, Canada based duo of Matthew Fuentes and Holly Forrest’s album May XXVI serves up a delectable platter of nine alternative rock influenced songs that, nonetheless, sport a relentlessly catchy edge. This sort of guitar-driven power pop with substanceby FXRRVST has a quality in short supply virtually every generation – the talent for bringing flesh and blood meaning to formulas established long ago when popular music first began its ascendance as a phenomenon with global reach. Their songs are clearly personal works without ever feeling claustrophobically self centered and their ability to speak with the air of personal experience while still reaching out to listeners marks them, definitely, as something different from many of their contemporaries. The strong interpersonal chemistry fuels much of the impact these songs make on the audience and many of them seem ideally suited for live performance. FXRRVST (pronounced Forest) has only been working together as a duo since 2015, but Forrest and Fuentes sound like they’ve been making music together their entire lives. “Road to Nowhere” opens with urgent acoustic strumming punctuated by brief and melodic guitar phrases. The phrases gradually lengthen as the song unwinds and an energetic shuffle beat soon enters to send the song off, but there’s a smattering of harmony vocals brought into play alongside some colorful dynamic shifts. The lyrical content isn’t particularly cheerful, but the arrangement definitely has a jaunty strut that nicely contrasts it. Holly Forrest’s vocal excellence is unquestionable – she inhabits the song with the sort of presence that we normally associate with much more experienced performers. “Picture Frames” tempers the pace, in comparison, and it allows Forrest even more of a chance to showcase her talents as a vocalist. The relaxed, yet thoughtful, vocal she delivers has equal parts ethereal beauty and a bit of bluesy gravitas. Despite the song’s relatively leisurely pace, Fuentes and Forrest have a songwriting aesthetic that keeps things percolating and peaking in all the right places. “Drown Me” veers closer to outright rock than anything else so far on the album, dispensing with the acoustic guitar we heard on the first two tracks, and Forrest gives a singing performance full of desperation, defiance, and determination. Fuentes’ guitar playing is particularly good here. The single “Tidal Wave” lays the groundwork for the song with an opening utilizing nothing but Forrest’s voice and an acoustic guitar running beneath her in the mix. A full band arrangement soon falls in behind her and the song has enough spring in its step to illustrate why the duo chose the track as a single. It’s an excellent representation of their catchiness and how that aforementioned quality never undercuts the substance underlying the playing and lyrics. The mood takes a decidedly melancholy turn on the song “Safe House” and the hypnotic minor key acoustic guitar motif threading through the song keeps that undercurrent of pain a constant throughout the track. May XXVI concludes with the track “Roofs” and the duo’s penchant for using unexpected instrumentation to enhance the material makes itself apparent from the first. It may be a little jarring for some to transition from a mandolin propelled introduction into a physical and breezy alt rock shuffle, but it’s a rewarding experience. The element of surprise with this tune is strong and it makes for a rousing curtain to a memorable album.